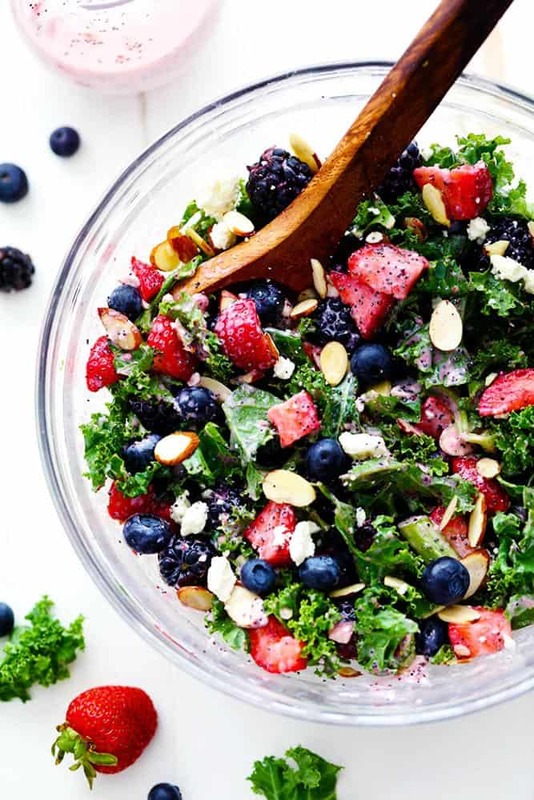 Triple Berry Kale Salad with Creamy Strawberry Poppyseed Dressing is made with delicious fresh summer berries and is tossed with kale, crunchy almonds and topped with feta cheese. A healthy and light salad that is perfect for summer! With all of these potlucks and no bake desserts it is time for a delicious and healthy salad. Am I right? I mean. My jeans are starting to get tight and when you have to get into a swimsuit with the kiddos a salad couldn’t sound better. 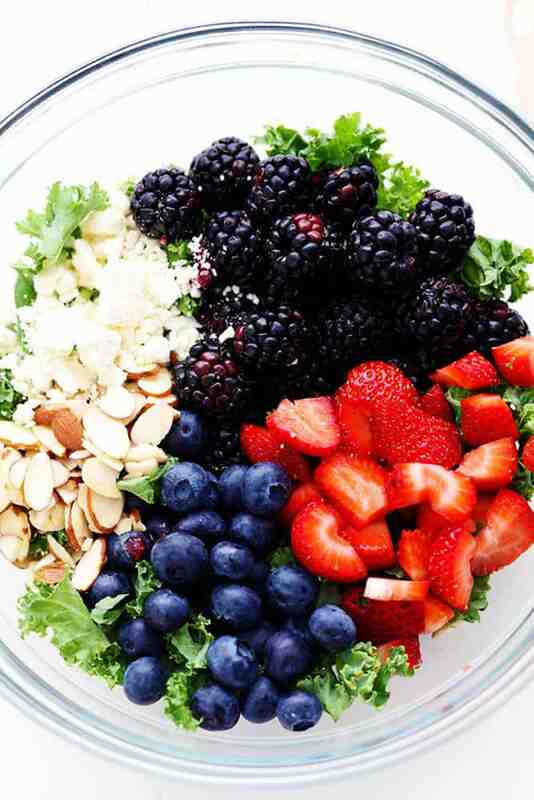 I love, love, LOVE fresh summer berries in salads. You get the best of both worlds with getting your serving of fruit and veggies in at once. 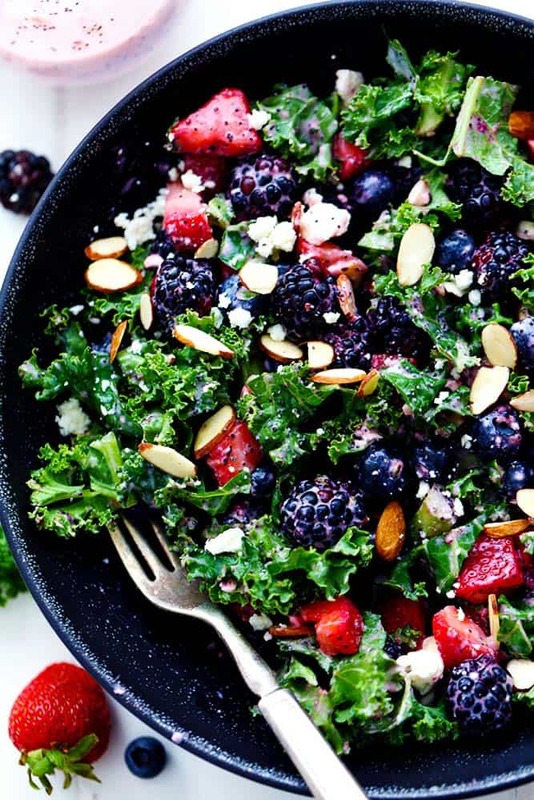 The berries give this salad such amazing flavor and texture. I like to use strawberries, blackberries and blueberries. I like to switch up what I use for the greens and kale is a great and healthy green full of nutrients. If you aren’t a huge fan of the texture of regular kale, baby kale is a great alternative as well. Everything comes together so well in this salad. Of course this dressing is what really makes this salad amazing. I used my favorite creamy seed poppyseed dressing. The original recipe calls for mayonnaise but I decided to make this salad totally healthy and delicious by substituting for greek yogurt. I added real strawberries to the creamy dressing and it was perfection! Once you toss this delicious salad in the dressing you top it off with some crunchy almonds and feta cheese. The perfect finishing touch to this salad. You are going to love everything about this easy and healthy salad. It is perfect for the summer and is sure to be a hit! TO make the dressing: Add the greek yogurt, strawberries, milk, sugar, and cider vinegar to a food processor or blender and pulse until smooth. Whisk in the poppyseeds. Drizzle the desired amount over the salad and toss. hey girl this looks really yummy! This is pretty good. I just made it and thought the dressing was too thin. I prefer a dressing with more body so would reduce the milk or leave it out altogether. The dressing also needs a pinch of salt to bring out the flavor (although I did not use feta cheese, so if I used feta that may be all the salt needed…just saying because this dressing would be good on lots of salad combos, with or without cheese, so adjust accordingly). You do not need 3 Tablespoons of sugar. I used half that and thought it was still too sweet. Next time I will use 1 teaspoon. Overall a pleasant recipe and beautiful presentation. I agree with the dressing being a little thin. I have reduced the amount of milk. Although I do think the sugar is necessary when using plain greek yogurt. Thank you for your feedback! You’re welcome, Alyssa. Thank you for being a good sport 😉 I do think you are brilliant with your recipes. I have been interested in more of your recipes than any other blog I follow because they look delicious, are full of comfort and fairly simple and are accessible, as in normal, tasty food men and children like to eat 🙂 Of course, I love to eat the recipes, too! 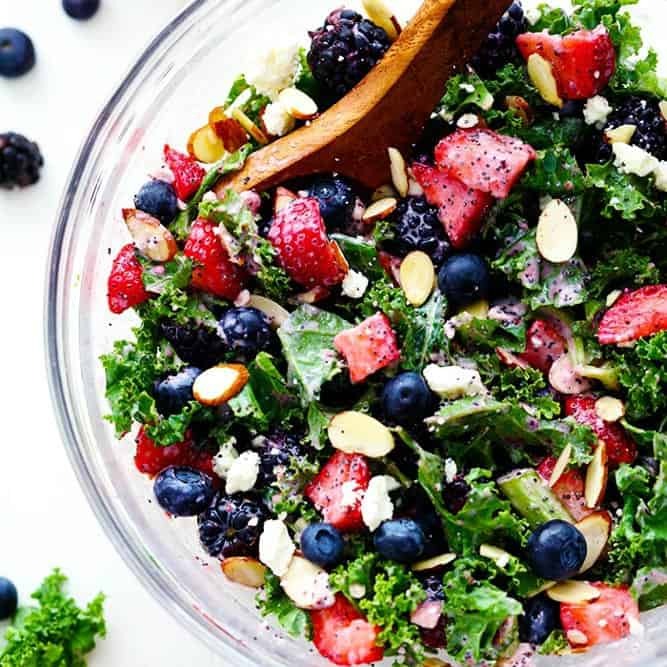 nice salad and love the fruit, even though a summer salad, still happy to have it in winter since I can get all of these ingredients, thank you for this recipe! Did you do anything to the kale before adding the rest of the ingredients? 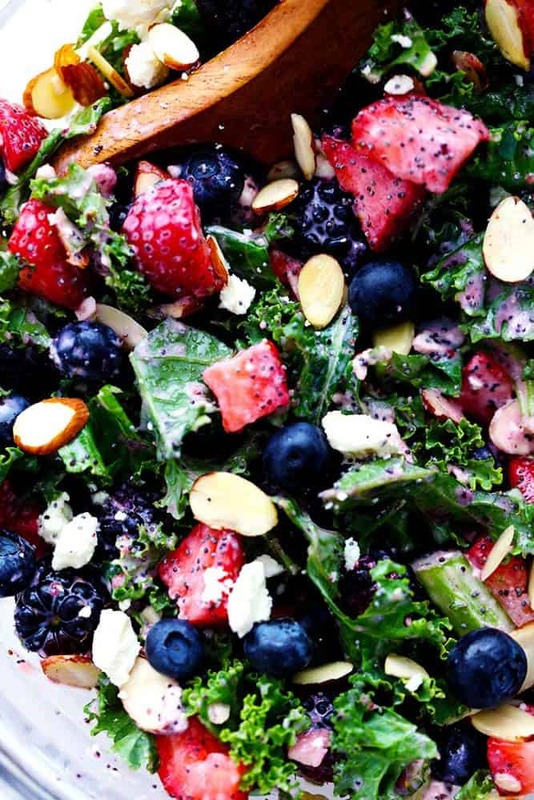 It seems most kale salad recipes include some sort of massage or soak first.